On Counterfeit Chips in US Military Hardware « Adafruit Industries – Makers, hackers, artists, designers and engineers! On Counterfeit Chips in US Military Hardware @ bunnie’s blog. Amendment 1092 to the Defense Authorization Act of 2012 is a well-intentioned but misguided provision outlining measures designed to reduce the prevalance of counterfeit chips in the US military supply chain. The Defense Authorization Act already has drawn flack for a provision that gives the US military authorization to detain US citizens indefinitely without trial, and I think it rather ironically requires an assessment of the US Federal Debt owed China as a potential “National Security Risk” (section 1225 of HR1540) — anyone want to take bets as to whether the conclusion of this assessment leads to prioritizing deficit reduction as a national security issue, or if it leads to justifying further borrowing from China to build up a military to fend off its biggest creditor? Under the proposed anti-counterfeit amendment, first-time offenders can receive a $5 million fine and 20 years prison for individuals, or $15 million for corporations; a penalty comparable to that of trafficking cocaine. While the amendment explicitly defines “counterfeit” to include refurbished parts represented as new, the wording is regrettably vague on whether you must be willfully trafficking such goods to also be liable for such a stiff penalty. If you took a dirty but legitimately minted coin and washed it so that it looked mint condition and then sold it to a collector as mint quality, nobody would accuse you of counterfeiting. 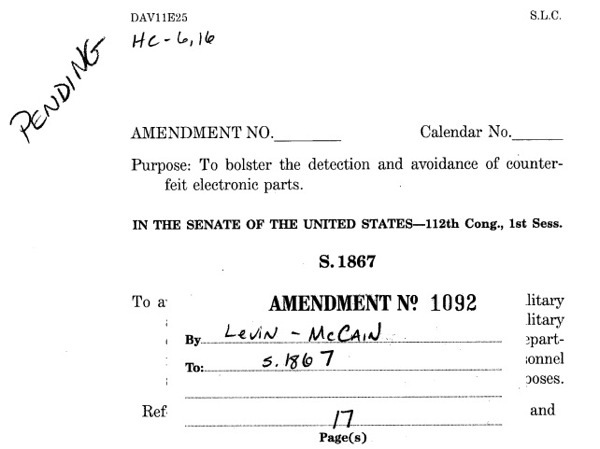 Yet, this amendment puts a 20 year, $5 million penalty on not only the act of counterfeiting chips destined for military use, but potentially the unwitting distribution of such chips that you putatively bought as new but couldn’t tell yourself if they were refurbished. Unfortunately, in many cases an electronic part can be used for years with no sign of external wear. A polished coin sold as new is not going to exceed its lifespan and undermine vital military hardware. The kinds of people who would be "unwitting victims" that might be affected by such a thing wouldn’t successfully make a sale to begin with – the customer would see that their paperwork was poor and stay away. Anything that goes into a military end-product has a LONG paper trail associated with it, including the component sourcing process. A vendor that can’t provide the paperwork isn’t going to make a sale in the first place.